If you are one of those people who think that lawn care consists of running a mower across the blades of grass once a week or so is complete lawn care, then you are not alone. Many people have that same view, and then wonder why their lawns look so patchy and brown while the lawn down the street is lush, green and full. The truth is, in order to obtain that perfectly cushioned, green lawn that will be the envy of the neighborhood; you have to do so much more than just mow it. A perfect lawn must be maintained. Maintenance should include: pest control, fertilization, disease intervention, weed control, and aeration as well as proper grooming techniques. Soil compaction is reduced allowing good deep roots to develop and better water absorption. Increased oxygen in the soil encourages worms, microfauna, and microflora. Lawn thatch is controlled allowing the thatch to do its job of controlling temperature and evaporation. Air penetration and nutrient absorption are both improved. Water runoff and puddling are reduced. Stress tolerance of heat and drought is increased. Resiliency and cushioning is improved. In short, aeration is an essential part of a healthy lawn. The timing of aerating is important to achieve the wanted results listed above. The best time to aerate and seed lawns is late summer to early fall. It is critical to aerate and seed your lawn as early as possible as germination & subsequent growth slows as temperatures cool. Stay ahead of the weeds next year by aerating and over-seeding in the fall. Our trained lawn care specialist use the highest quality seed, fertilizer and equipment to aerate your lawn, resulting in a more lush & healthy lawn. They can determine exactly what your specific lawn needs are simply by conducting a quick inspection, and they know exactly how to deal with the issues that arise. 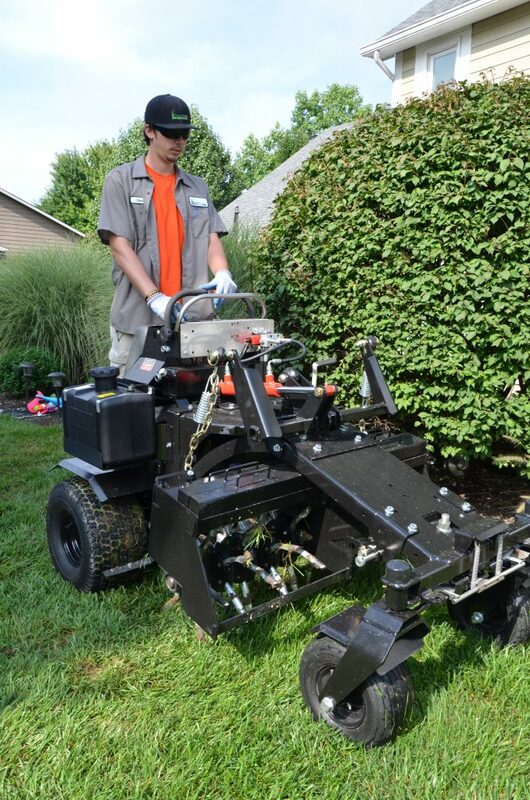 From the timing of aeration treatments to the proper pest treatment to the proper fertilizer, to the proper blade length, your GreenLawn by Design lawn care specialists are trained to know how to efficiently deal with each of these aspects to ensure you have a healthy and lush lawn throughout the year. Why spend countless hours researching on the internet for ways to make your lawn healthy and happy when the award-winning experts at GreenLawn by Design already have the answers. With GreenLawn by Design, you can turn your attention to more enjoyable endeavors and leave the intricate lawn details up to us. Soon, you will be the talk of the town as you host your summer barbecues on your perfectly groomed, healthy, lush green lawn. We are offering a 15% neighborhood group discount. Schedule 3 or more neighbors on the same day and each homeowner receives a 15% neighborhood discount. All services are guaranteed to your satisfaction. Rejuvenate your lawn today by contacting us at 317-804-8088 or email greenlawn@greenlawndesign.com.